An eight year-old British Cypriot girl, Saffie Rose Roussos (pictured), has been named as one of the 22 victims of the suicide bombing attack last night at Manchester Arena. She went to the concert with her mother Lisa and her older sister Ashlee Bromwich. Lancashire County Council confirmed that the British Cypriot school girl was killed at the end of the concert by Ariana Grande that she went with her mother Lisa and her older sister Ashlee Bromwich. Both were later found injured in separate hospitals. Cyprus Foreign Ministry has announced that so far there is no information about Cypriot citizens among the victims of the attack in Manchester. In a statement issued on Tuesday the MFA says that is closely monitoring the situation and is in close contact with the British authorities via the High Commission of the Republic in London. The Foreign Ministry calls on Cypriot citizens who are in Great Britain, especially in Manchester, or who plan to travel there to follow the media and the instructions of the British authorities carefully. The High Commission in London is available to provide assistance to Cypriot citizens. For more information and consular assistance, Cypriots can contact the following numbers, especially if they have not communicated with their relatives. Cyprus football championship concluded on Sunday with the games of match day 10 of the play off. The champion team of APOEL drew 2-2 with Apollon at GSP Stadium in Nicosia. The team of Nicosia clinched its fifth consecutive championship title and 26th in its history and will take part in next year`s UEFA Champions League.Runner up AEK of Larnaca beat at Antonis Papadopoulos Stadium Anorthosis with 1-0. APOEL will represent Cyprus in next season`s Champions League qualifying games. On the other hand, AEK, Apollon and AEL will participate in Europa League’s qualifications. As regards the second group of the play off, Karmiotissa was downgraded, and the team moves to the second division. The results of match day 10: APOEL-Apollon 1-1, Anorthosis-AEK 0-1, AEL-Omonia 3-2, Ermis-Ethnicos 3-4, Doxa-Nea Salamina 0-3, Karmiotissa-Aris 5-1. Group B: Nea Salamina 45, Ethnicos 43, Ermis 42, Aris 41, Doxa 37, Karmiotissa 37. Cyprus’ strong GDP growth is credit positive for Cypriot banks because it will strengthen their clients’ capacity to restructure and service their high levels of distressed debt, according to Moody’s credit outlook. Last Tuesday, the Statistical Service of the Republic of Cyprus announced that its flash estimate for the country’s annual GDP growth rate in first-quarter 2017 was 3.3%, the highest in Cyprus since 2008. Additionally, Moody’s points out that the growth will support real estate collateral values, on which Cypriot banks rely heavily for most lending, and increase new lending opportunities that will support banks’ declining net interest income. At the same time Moody’s estimates that the acceleration in economic activity will strengthen businesses’ cash flows and improve labour market conditions for households. “Ultimately, the higher growth will enhance borrowers’ debt affordability and repayment capacity, facilitating loan restructurings, particularly in the small and midsize enterprise sector, which is more vulnerable to economic changes and benefits from an economic recovery, albeit with a lag”, says the report. Moody’s also expect banks’ asset quality to continue to improve, in line with the accelerating growth trend and banks’ restructuring initiatives. Bank of Cyprus, is expected to gain the most, given that it has the largest direct exposure to domestic real estate. Additionally, Moody’s expect Cyprus’ improving economy to create new lending opportunities for banks and ease the decline of interest rates that banks charge on loans. The report says that if sustained, the country’s performance will exceed the 2.7% real GDP growth forecast for 2017. It adds that notwithstanding the improving economic environment, it will take time for Cypriot banks to rehabilitate their balance sheets because of the long cure periods for restructured loans before they are reclassified as performing, and substantial volumes of distressed debt with system -wide problem loans at 49% of gross loans as of September 2016. London Greek Radio are delighted to welcome their newest sponsor to the LGR airwaves. DODONI S.A. was founded in 1963, counting 54 years of authentic tradition and history. The company based in Ioannina produces authentic, purely Greek dairy and cheese products, using 100% Greek cow’s, goat’s and sheep’s milk collected daily by an expanded network of 5,000 Greek producers, mainly active in the region of Epirus. With more than 10,000 selling points in Greece and export activity in 43 countries, DODONI has 9 categories of dairy and cheese products and produces 80 distinct products. This truly authentic Greek brand is distinguished for its taste, quality and their 100% Greek identity. Now DODONI will not only be known for their exceptional Feta cheese, but for their collaboration with our station to bring you the best Greek hits (as well as the best Greek cheeses). We, Greeks, have many reasons to be proud of. One of them is our feta. A cheese so special and unique that has become famous all over the world. “DODONI feta, using exclusively 100% greek pasteurized goat’s and sheep’s milk, that arrives every day in our premises even from the most distant farms. If you love to cook with Feta, just as much as you love to eat it, then be sure to visit a special little corner of the DODONI website where they offer their unique cheese based recipes: Click here to visit their “brunch” section, which should be enough to whet the appetite and flare the creativity of any aspiring chefs. Russia’s Foreign Minister Sergey Lavrov urged Thursday for restraint with regards to Turkish threats in Cyprus’ exclusive economic zone. Lavrov was speaking after a tête-à-tête meeting with his Cypriot counterpart, Ioannis Kasoulides, at the Foreign Ministry in Nicosia. The top Russian diplomat arrived earlier today in Cyprus for bilateral talks and will attend on Friday the 127th Ministerial Session of the Committee of Ministers of the Council of Europe, the last event under the Cyprus Chairmanship of the CoE. Tomorrow he will be also received by the President of Cyprus, Nicos Anastasiades. Asked by CNA on Turkish threats in Cyprus’ exclusive economic zone, Lavrov replied that “all such issues and debatable ideas should be discussed within the legal framework, with the agreement of all stakeholders”. He added that “in this situation, as in any such situation, there is a need for restraint from this threat of using force and from using force itself”, and expressed hope that “all stakeholders choose such a path”. Speaking through an interpreter, the Foreign Minister also reiterated Moscow’s support for a just, lasting and viable settlement of the Cyprus problem, based on relevant UN Security Council resolutions and the agreements reached between the two communities. Foreign Minister Kasoulides said from his part that he briefed his counterpart on the current state of negotiations and expressed Cyprus’ appreciation for the “unremitting principled position of the Russian Federation”. “We particularly highlighted that the United Nations Security Council has a crucial role, not only in endorsing a possible solution, but in taking those necessary decisions for its comprehensive implementation”, Kasoulides underlined. He said moreover that he informed Lavrov about the hydrocarbon exploration and exploitation program of Cyprus and referred to “Turkey’s aggressive policies in the Eastern Mediterranean, which further complicate the efforts to reach a settlement of the Cyprus problem”. In reply to a relevant question, Kasoulides said that they discussed this issue with Lavrov, he did not, however, disclose more details. He said that “there is a common understanding that international law, the UN Convention on the Law of the Sea, has to prevail in any circumstances”. Moreover, the Foreign Minister of Cyprus said that they discussed with Lavrov bilateral relations, cooperation in the economic and legal fields, as well as cooperation in international fora. Minister Kasoulides added that, during working lunch, the two Ministers would also “push for the finalization of various agreements” under negotiation. He said that they would discuss a number of global and regional issues of mutual concern, including Ukraine and “the necessity for the full implementation of the Minsk Agreement”. On Syria, Kasoulides stressed that Cyprus, the closest EU member state to this country, would like to see a Syrian-led political transition process to establish a democratic, inclusive and representative government by the Syrians, for the Syrians. Finally, Kasoulides commented on EU-Russia relations, noting that “the current state of relations is beneficial to neither side” and expressed hope for the reevaluation of the situation, leading to a “mutually beneficial reengagement”. Taking the floor, the Foreign Minister of Russia said that “Cyprus is our important time-tested partner in Europe” and noted that they reviewed bilateral relations with Kasoulides. He remarked, moreover, that although bilateral trade has shrunk over the past years, it has picked up significantly in recent months. Lavrov also said that international terrorism calls for a “joint, unified agenda instead of the confrontational policy chosen by several Western countries”. The fight against terrorism calls for a settlement in the Middle East and Northern Africa, but first and foremost in Syria, he went on. Speaking about the situation in Ukraine, he said that “we need to thoroughly and fully implement the Minsk package”, he added however that recent action by the Ukrainian authorities shows that “it is either not willing or incapable of doing so”. Commenting on the state of Russia-EU relations, he said that there is no cause for satisfaction there and noted that cooperation must be based on equal rights and mutual respect. For that to happen, Brussels must stop having a “one-way street game” Lavrov noted. He further expressed gratitude that Cyprus is part of the group of countries within the EU, advocating normal cooperation between the two sides. Lavrov was also asked about the reported passing of classified information to senior Russian officials by the US President. In his reply, he referred to reports saying that the secret passed was about terrorists being capable of staffing electronic devices with untraceable explosive material. He added that one month ago, the Trump administration imposed a ban on laptops being carried on airplanes coming from seven Middle Eastern countries, due to a terrorist threat. “So if you’re talking about that, I see no secret here” he said. He also noted that “many US mass media use the principle used by the Soviet Union media” in vain. Asked about reports concerning an initiative in Washington to create a NATO-like alliance among Persian Gulf countries, the Russian Foreign Minister said that complicated issues in the Middle East and Northern Africa should be solved on a collective basis, without excluding anyone. He added that when negotiations between US President Donald Trump and his counterparts in the Middle East take place “we’ll have more clarity and then we can discuss it”. Cyprus has been divided since 1974, when Turkish troops invaded and occupied 37% of its territory. Cyprus President Nicos Anastasiades and Turkish Cypriot leader Mustafa Akinci have been engaged in UN-led talks since May 2015 with a view to reunite the island under a federal roof. Dimitris Basis was born in Stuttgart. His parents lived in Germany for some years. He went to Greece for the first time at the age of eight when his entire family returned to Herso, a small village in Northern Greece. At the age of nine, he started chanting the liturgy in the local church and three years later he began to study Byzantine music. He gained his diploma at the age of seventeen. At the same time he used to sing at many cultural celebrations. When he was twenty years old just after his first steps in professional singing he was discovered by Stamatis Kraounakis and Warner Music company who immediately offered him a contract. For three continuous seasons he was singing with Alkistis Protopsalti, Stamatis Kraounakis and Lina Nikolakopoulou, and wrote history due to his musical performances under the music director Andreas Voutsinas. Since then he has worked with collaborated with many well known singers, song-writers and composers such as Christos Nikolopoulos, Lina Nikolakopoulou, Dimitra Galani, Manolis Lidakis, Haris Alexiou, Yiannis Kotsiras, Stavros Xarhakos, Eleni Tsaligopoulou, Mikis Theodorakis, Maria Farantouri, Pashalis Terzis and Dimitris Mitropanos. In the summer of 2003, he took part in a dedication to the poet Yiannis Ritsos –throughout Greece- with the “Mikis Theodorakis” Orchestra. The poems (“Epitaphios, Romiosini, Ta Dekaohto Lianotragouda tis Pikris Patridas, I Piites tou Kosmou) were composed by Mikis Theodorakis. In May 2005, he took part in the celebrations in honour of the eightieth birthday of the famous composer Mikis Theodorakis. The titles of the songs which he sang were “The Songs of Passion and Love”. These celebrations took place during the “Greek Festival” in Herod Atticus Odeon. In the same year’s summer he departed for the first time on a successful solo tour at selected cities around Greece. We will be lucky to see him, performing live his latest great hits. “To Kalitero Paidi” Yiannis Ploutarchos will be headlining the 35th CyWineFest at Lee Valley Athletics Centre, for what promises to be a spectacular bank holiday weekend! Doors open at 12:30 – 23:00 on Sunday 28th and Bank Holiday Monday 29th May 2017. With almost a thousand free car parking spaces, you won’t need to worry about parking the car. There are also public transport links as the venue is sandwiched between Angel road and Ponders End stations. Alternatively, the W8 bus route starting at Chase Farm via Enfield Town and terminates directly opposite venue. Despina Vandi is considered one of the top Greek and International performers in the world. Beginning her career in 1994, for more than 2 decades she has achieved record sales on her multi-platinum recordings, racked up 25 awards, boasts ten international releases and a Billboard No. 1 as she won the US Billboard Hot Dance Airplay with her album “Geia!” (“Hello!”). She is indeed one of Greece’s largest and most loved commercial exports. Despina received her first major award in 2000 from the director of Virgin Megastores, London, for the success of her CD single “Ypofero” (“I Am Suffering”), as the best-selling CD of all time in Greece. In 2001, for her album “Geia!” (which went 4 times Platinum within just eleven days) she won World’s Best Selling Artist at the World Music Awards held in Monte Carlo, marking the first time this was awarded to a Greek artist. For the same album and tracks from it, she received prestigious accolades from Portugal and Russia. Despina followed up with more multi-platinum discs, sold-out concerts in Europe, America and Australia, collaborations with international DJs and world-renowned producers such as Armand Van Helden, Milk & Sugar, Nick Skitz, Roger Sanchez and German electronic impresario, Schiller. Despina Vandi is also a star of the small screen, starting in 1999, in the role of Haroula, in the television series “Two Foreigners” which received raving reviews at the time. 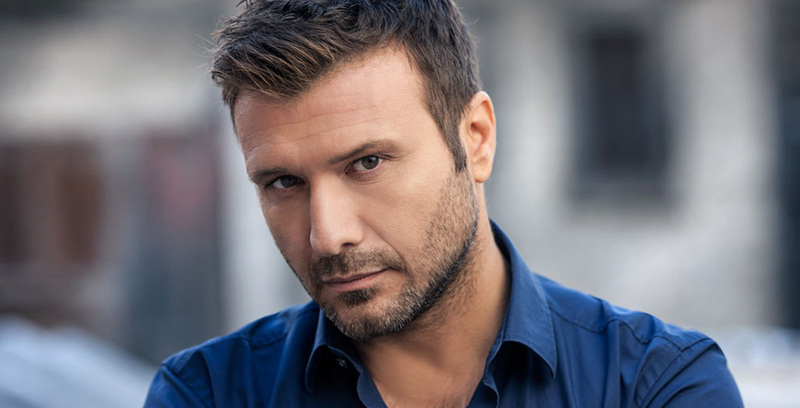 In 2013 and in 2014, together with Greek actor Giorgos Kapoutzidis, Despina co-hosted the Greek final song selection for the Eurovision Song Contest. Later, in 2016, she hosted the 6th “MadWalk” (MAD TV) with resounding success! Despina Vandi was one of the four “legend” coaches in the TV talent show “The Voice” of Greece (2014-2015), and was the winner coach in the first year. She returned to the judging panel for a new format primetime TV talent show “Rising Star” of Greece. From the small screen to the stage, and her participation in the hit musical MAMMA MIA was her first step into musical-theater. Despina Vandi, interpreting her role as Donna Sheridan, grabbed headline reviews and won the hearts of critics and audiences alike, opening a new chapter to her multidimensional and highly successful artistic career. All tickets include a welcome glass of champagne. Balcony ticket holders are advised to arrive at 8.30pm. Last night Cyprus and Greece celebrated qualifying through to this Saturday night’s Eurovision Song Contest final. This year’s Eurovision will be held in Kyiv, Ukraine, at the International Exhibition Centre IEC. Demy (representing Greece) and Hovig (representing Cyprus) made it to the Top 10 qualifying songs after enduring a very competitive semi-final phase. The semi-final rankings will not be announced publicly until after this weekend’s Eurovision final, which maximises fans’ suspense. It is a result which spelt the Greek’s return to the contest’s final after last year’s very early exit. It’s a solid come-back, for this country who’s always qualified except that minor-blip, which we can now begin to erase from our memories. Demy looked absolutely stunning in her pale outfit as she performed her song ‘This is love’. It’s a progressively up-tempo track which is catchy and radio-friendly. The track was composed by Eurovision veteran Dimitris Kontopoulos, with creative staging by Fokas Evangelinos, the Greek’s dynamic Eurovision team. The 25-year-old Greek pop singer seemed to enjoy her time on the stage, joined by her dancers Iasonas Mandilas and Paris Paraskevadis-Planets. She was also accompanied by off-stage backing-vocalists Erasmia Markidi, Evgenia Liakou, and Marcus Giakoumoglou. For those who missed it, we can confirm it was a very slick and well rehearsed performance. Cypriot singer Hovig also celebrated a successful night. His performance involved an excellent staging concept which complimented his song greatly. He performed a modern radio-friendly track with electronic beats, written by Thomas G:Son, a well-known Swedish composer and producer in Eurovision circles. 28-years-old Hovig, a Cypriot artist of Armenian heritage, shows he was proud to have this chance to fly the Cypriot flag. The Cypriot broadcaster internally selected Hovig and G:son for this year’s Cypriot song. Hovig was vocally very solid and interacted well with his dancers Marios Charalambous and Pavlos Lazarou Kertepene. The artist seemed relaxed and sung his cool song, mastering the stage’s full width to tell us his story, about gravity. The Cypriot artistic director Charis Savva put much effort in to make sure he nailed the performance, and clearly it worked extremely well. The Cypriot’s have pulled out all the stops to be noticed and they were. Greece and Cyprus confirmed they will be performing second-half draw for the final, with 26 countries competing. Demy and Hovig have to wait till Thursday to find out the other qualifiers. What we know for certain is that they have earned their place next to the big 5 automatic placers: the UK, Spain, France, Germany and Italy in the final this weekend. The Eurovision Song Contest Final airs this Saturday at 8 pm UK time; you can follow it live on BBC 1.